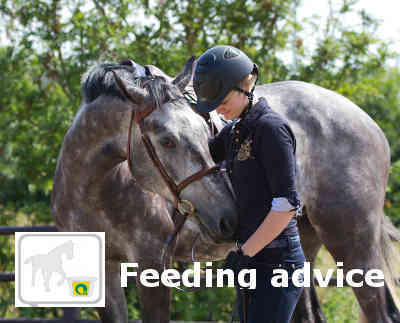 My horse or pony has to lose weight. How can I handle this? An overweight horse does not fit well in his or her skin. This shows you behavior, health and sport. The cause of a fat horse can have several reasons. As an example, feeding too much energy-rich food or too little movement. This is why it is important that the labor and food are well-matched. When it is necessary to lose weight, it is important to move a lot through labor and the meadow. In addition, the concentrate can be limited. The carbohydrates (sugar) from the concentrates are converted into fat into the body, which can lead to growth. When doing light work, you can even stop feeding food. It is the intention of getting less energy than the horse needs. Hence, the reserves will burn. When the horse does heavier labor, the concentrate can be halved. A horse needs daily building materials that consist of vitamins, minerals, amino acids and trace elements. By replacing the concentrate with Hartog Lucerne-mix, the horse or pony gets the above-mentioned necessary building materials without the horse or the pony getting too much carbohydrates and poorly digestible proteins. The Lucerne mix provides a shiny coat, enhancing the horse shoe and promoting the development of the muscles in the neck and back. By eating a lot of roughage such as Hartog Lucerne-mix, Compact Grass and / or Gras-mix, gastrointestinal problems are prevented and natural eating behavior stimulated. No additional supplements are required in this ration. The Hartog Feed Box XL can be used when feeding. The feed box is equipped with a metal rack. This stretch slows down the food intake. It is wise to provide good quality roughage and to adjust the quantity to the situation. You can change the roughage by feeding less rich hay or dry soil. Inadequate roughage can cause gastrointestinal problems, which is because a horse in free nature eats 14 to 16 hours of fiber-rich roughage. The stomach continuously produces gastric acid. By chewing on fiber rich foods, the animal makes saliva which facilitates swallowing and promotes the mixing of gastrointestinal juices. This saliva reduces the acidity in the stomach. Hence, begin with adjusting the power feed schedule to prevent stomach and intestinal problems. Do not let your horse lose weight so that health problems can arise. A mineral lick or whey can be hung in the box at all times. He will use this when he is short of minerals.